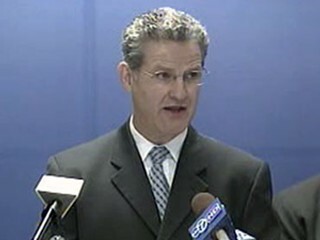 DuPage County Illinois States Attorney, Joe Birkett’s office just sent out an email blast regarding the recent liberal media’s smear campaign aimed at Governor Sarah Palin and her family. He slams the media for their pettiness then rips into Obama’s political fortitude. I’d like to see the national media ask that tough question of Obama. Illinois is one of the most heavily taxed and corrupt states in the union. Gas prices and sales tax are the the highest in the nation, unconstitutional handgun laws have made the City of Chicago more unsafe and dangerous than ever, and cronyism, corruption, and pay to play are rampant. That is the type of leadership an experience we can look forward to under an Obama administration. My wife is one of those who enjoy reading the Hollywood gossip magazines. I admit to feeling the urge to flip through these tabloid magazines every once and a while, but I can’t help but to give a chuckle after most of the stories. US Weekly and OK magazine are a couple of those that I see her read with some regularity. Normally, I don’t pay much attention to the content of these trash mags until I saw the latest covers floating on a few blogs. 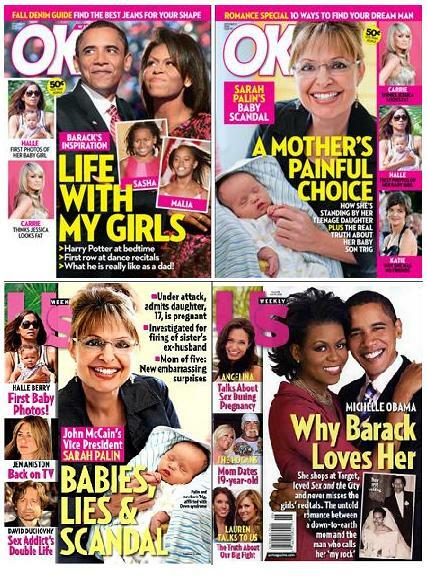 The latest issue of US Trashy blasted on the cover, “Babies, Lies, and Scandal”. Where are the lies? No scandal has been proven and probably never will be, and as for the babies, that has nothing to do with this election and it reaks of sexism. Do you think US Weekly may have an agenda when they publish trash like this, but when covering Obama in June the headline read “Michelle Obama, Why Barak Loves Her”? Would it surprise you to know that if the owner of US Weekly, Jann Wenner (founder of Rolling Stone magazine) is a staunch Barack Obama supporter and major donor? In the latest OK edition, the front cover features Obama and his family and reads, “Life With My Girls”, and of course paints a perfect family picture. In unsurprising contrast, the flipside shows Alaska Governor Sarah Palin, John McCain’s new running mate, holding her baby boy Trig. The unabashed headline states, “A Mother’s Painful Choice,” and alludes to the blatantly false internet rumor in which Gov. Palin allegedly faked her pregnancy and birth to her Down’s syndrome afflicted son. This apparently was meant to cover up the out of wedlock teen pregnancy of her 17 yr old daughter Bristol. The story has no legs and has been rebuffed Alaskan locals who are familiar with the young Palin and her fiancé, Levi Johnston. The bias is unmistakable and outrageous. I don’t care is these tabloids ruffle the feathers of my favorite TV and movie stars. They get paid big bucks to put up with it. However, when you attack a public citizen’s character and minor child for political motivation it is deplorable and reprehensible. Conservative and fair minded people who read these magazines should be outraged and write to the editors of this garbage. Tell them you won’t buy their junk if they keep printing this viciousness. Unfair, lop-sided coverage of this election is unbelievable. If the “real” media would have picked up the Edwards story, as they should have, a garbage paper like the Enquirer would never have had a chance, and might have run a story about how good Britney Spears is looking these days. Everywhere you look you can’t escape the hyped up one sided stories about “the one”. Now it’s even in the checkout aisles at the supermarkets. Entertainers should stay out of politics, and so should the tabloids that cover them. The line between Hollywood and Washington is getting blurred indeed, and frankly I am sick of it. I am tired of listening to actors and singers donating their image and time to support their “feel good” liberal candidates and causes, and I’m tired of politicians pandering to their audiences via the entertainers that I would like to enjoy.